The hype machine is kicking in big style for the new Tom Jones album (released in November) with strings on a few tracks by realstrings.com, including the first single – If He Should Ever Leave You. Does Tom Jones need a hype machine? Strewth, he’s a legend, but maybe even he needs a marketing campaign. The gig came through Darren and Tunde of Future Cut who will be shooting up the kudos ladder when this one is finally released. We recorded the strings in London earlier this year and for such a high profile album, it was probably one of the most straightforward gigs. The arrangements came together with minimum fuss – Darren and Tunde had put together some string ideas and I developed these. The brief was classic soul and that seems to be what the first reviews are loving. The track is already all over the internet, so here it is in full (streamed from Rolling Stone). Strings don’t really do much till later in the song. I know the track is already getting loads of broadcast play, so if you see me driving round in a Porsche you’ll know the PPL lived up to expectations! 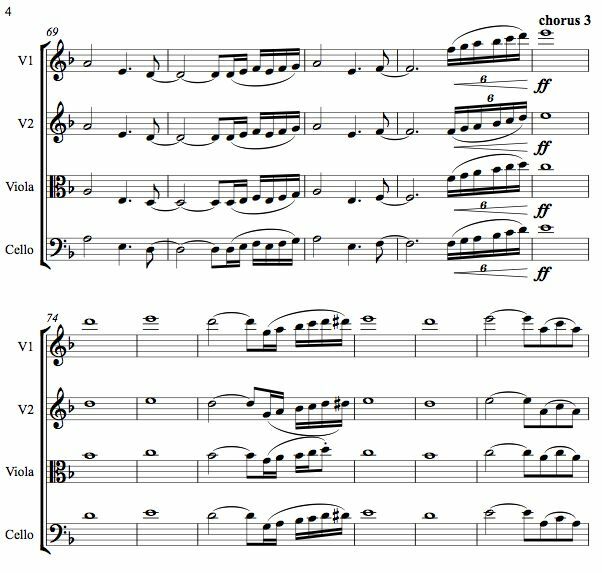 And here’s an extract from the string score for the session. One of the great challenges for us working with audio is communicating ideas with words. It just leads to so much confusion, partly because music expresses emotions beyond words, but also because we struggle to describe specific points in the music. Soundcloud.com is a cool new web service for anyone dealing with audio. You really have to sign up and play around with it to get a feel for what it is! As well as being able to upload large audio files and share them, you can attach comments to the wave form. It won’t embed here, but try looking at it on the soundcloud website. Roll your cursor over the little avatars under the waveform to see comments, attached to specific points in the music. Here’s a screen shot; click to go to the site. It’s in beta at the moment but my simple 4 bars were easy to create with intuitive tools. As a demonstration tool of musical examples (chord movement, melodic shapes – many things related to music language) it is invaluable. The sounds are basic and playback lacks any finesse, but that is true of notation packages, where the look is the priority and the sound provides the bare essentials of pitch and rhythm. Jobs come in, we turn them round, and they go, then sometimes (forgive me!) we forget about them. And months down the line they pop up, neat and tidy and finished. This week I came across 2 albums of production (library) music released by West One Music that I’d worked on and are now all shiny and topped off! One is ‘Inspired‘ by Jay Price and the other ‘Cinematic Strings and Beats’ by Caspar Kedros and Scott Doran. It’s still immensely satisfying to hear the completed mixes, as when we’re playing on the tracks they are in a work-in-progress state and my contributions tend to be a library of string ideas and files that could end up anywhere in the arrangement and mix. And it’s not until you hear the completed track that all the elements make sense. Now, I’d just like to hear them plastered all over some tv broadcasts. Loops are a big part of the music composing and production process so I’m getting involved in the market with some realstrings loops libraries. I released my first library through Samplebase and now I’ve just completed my second one and it’s released by Organic Loops.